Republican opposition to any Supreme Court nominee by President Barack Obama may be politically popular, a new poll claims. Majority Whip John Cornyn, R-Texas, distributed the poll findings in a memo to members of the Republican Senate Conference to show public perceptions on filling the current Supreme Court vacancy, Politico reports. The opinion poll was conducted by GS Strategy Group, a consumer and political research organization. The survey found almost unanimous awareness of the death of Justice Scalia, strong support for originalist intent in interpreting the Constitution, and concern over President Obama appointing a liberal justice who would tip the ideological balance of the court. The poll collected the opinions of 600 likely voters and was conducted Feb. 27-29. More than half of those surveyed were more concerned about a liberal judicial appointment than leaving the Supreme Court seat open for a year or longer. A 54-percent majority said they believe that Obama would nominate a liberal justice and his nominee would shift the court’s ideological balance. Nearly 56 percent said Supreme Court justices should base their decisions on the framers’ intentions, reflecting deceased Justice Antonin Scalia’s strict approach to constitutional interpretation. The poll “shows that the American people recognize the vital importance of finding a replacement for Justice Scalia who will adhere to the Constitution and the rule of law,” Hans von Spakovsky, manager of The Heritage Foundation’s Election Law Reform Initiative and a senior legal fellow at the think tank, told The Daily Signal. “Voters clearly believe that they should choose the next justice through their choice of the president who will replace Barack Obama,” von Spakovsky said. A Wall Street Journal poll released March 8 found that 55 percent of all registered voters disagreed with Senate Republicans’ refusal to set Judiciary Committee hearings to vet a potential Supreme Court nominee, reported the U.S. News and World Report. Politico reported that Senate Majority Leader Mitch McConnell, R-Ky., refused to hold confirmation hearings for an Obama nominee on Feb. 13, the day Justice Scalia’s unexpected passing was announced. 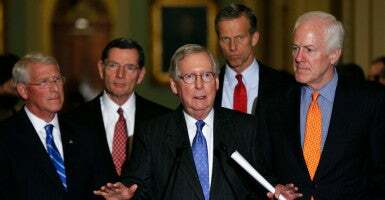 “I’ve said repeatedly and I’m now confident that my conference agrees that this decision ought to be made by the next president, whoever is elected,” McConnell said, reported CNN. Cornyn’s Senate office did not respond to The Daily Signal’s request for comment.